Chevrolet Impala 2014, 2015, 2016, 2017, 2018, Without Navigation System, Without OEM Wood, Full Interior Kit, 49 Pcs. Chevrolet Impala 2014, 2015, 2016, 2017, 2018, With Navigation System, Without OEM Wood, Full Interior Kit, 49 Pcs. Chevrolet Impala 2006, 2007, 2008, 2009, 2010, 2011, 2012, 2013, With Bucket Seats, Full Interior Kit, 45 Pcs. Chevrolet Caprice 1994, 1995, 1996, Chevrolet Impala 1994, 1995, 1996, Interior Dash Kit, With Column Shifter, 26 Pcs. Chevrolet Caprice 1994, 1995, 1996, Chevrolet Impala 1994, 1995, 1996, Interior Dash Kit, With Floor Shifter, 27 Pcs. Chevrolet Impala 2006, 2007, 2008, 2009, 2010, 2011, 2012, 2013, With Bench Seats, Full Interior Kit, 42 Pcs. Chevrolet Impala 2014, 2015, 2016, 2017, 2018, With Navigation System, Without OEM Wood, Basic Interior Kit, 36 Pcs. 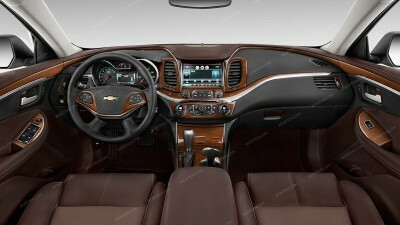 Chevrolet Impala 2014, 2015, 2016, 2017, 2018, Without Navigation System, Without OEM Wood, Basic Interior Kit, 36 Pcs. Chevrolet Impala 2006, 2007, 2008, 2009, 2010, 2011, 2012, 2013, Basic Interior Kit (Regular Kit Or Match OEM), 12 Pcs. Chevrolet Impala 2000, 2001, 2002, 2003, 2004, Exterior Kit, 7 Pcs., Synthetic. Chevrolet Impala 2006, 2007, 2008, 2009, 2010, 2011, 2012, 2013, Exterior Kit, 15 Pcs. Chevrolet Impala 2014, 2015, 2016, 2017, 2018, Exterior Kit, 8 Pcs. Chevrolet Impala 2014, 2015, 2016, 2017, 2018, Stainless Steel Pillar Posts, 8 Pcs. Chevrolet Impala 2000, 2001, 2002, 2003, 2004, 2005, Stainless Steel Pillar Posts, 6 Pcs. Chevrolet Impala 2006, 2007, 2008, 2009, 2010, 2011, 2012, 2013, Stainless Steel Pillar Posts, 4 Pcs. Chevrolet Impala 1994, 1995, 1996, Interior Kit, Optional Speedometer Cluster (Impala SS 1996 Only), 1 Pcs. Chevrolet Impala 2014, 2015, 2016, 2017, 2018Exterior Kit, Optional Fuel Door, 1 Pcs.